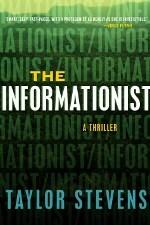 Instead of The Seven Questions Series this month, I have a special treat for you: an audio interview with Taylor Stevens, author of The Informationist. Seven questions just weren’t enough. I plan to post the interview and a review of her book tomorrow, so be sure to stop back. Her book is amazing and so is the author!